I have been busy working on mini journals for a swap. 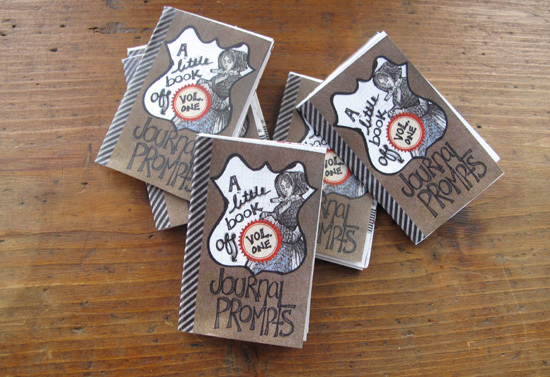 I had to make 26 little journals - and package them up super cute. I wanted to share the process with you. 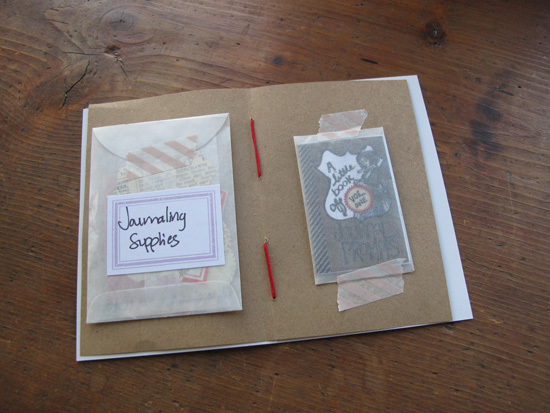 I also have two extra mini journal packets - and wanted to offer them as a giveaway. So - if you leave a comment telling me a favourite quote of yours - you will be entered into the giveaway - I will pick 2 winners out of all entries between now and May 21th and announce them here on the 23rd. UPDATE: Contest has ended - but please feel free to still leave comments with your favourite quotes! Here are the books after I photocopied them smaller and did the magic cut and fold thing (that really seemed like rocket science the first couple tries). I decided to make little books to house them in, so I used one of my greeting cards and sewed in one page of kraft paper with some red twine. All the books are packed up in cute pink and white stripped candy bags ready to be mailed out... and the two extras sitting here on my desk waiting to see where they will be sent - so be sure to enter for a chance to win one! Leave a comment telling me a favourite quote of yours - you will be entered into the giveaway to win one of the two extra mini books as shown in this post - I will pick 2 winners out of all entries between now and May 21th and announce them here on the 23rd. UPDATE: Contest has ended - but please feel free to still leave comments with your favourite quotes! I saw this quote JUST this morning and it spoke volumes to me!!! "When they attack you & you notice that you love them with all your heart, your work is done." - Byron Katie. I try to embrace a positive attitiude and this reminds me to do that! "One hundred years from now, it will not matter what kind of car I drove, what kind of house I lived in, how much money I had nor what my clothes looked like. But the world may be a little better and the universe a little brighter because I was important to a child". 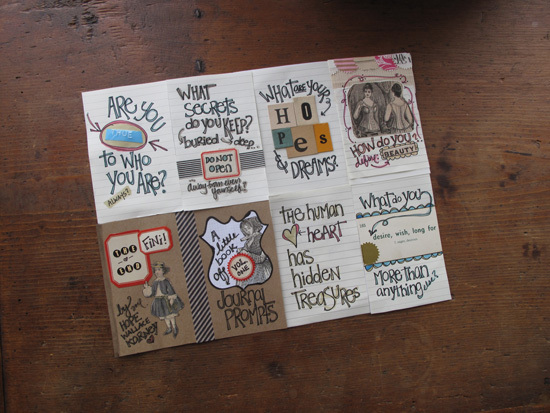 Your journal books are wonderful and I would be honored to win one! 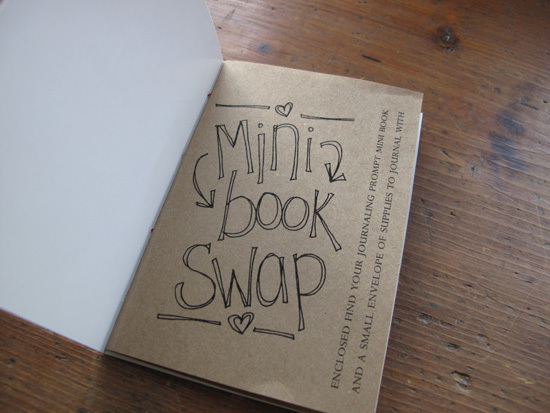 Your mini book is so cute! Love your blog. "If you can't be a good example, then you'll have to be a horrible warning." these mini-journals look so cute! "The ultimate measure of a man is not where he stands in moments of comfort, but where he stands at times of challenge and controversy." -Martin Luther King, Jr.
*Just to sweeten the deal, should I be luckey enough to win, I will send you something equally delightful in return. 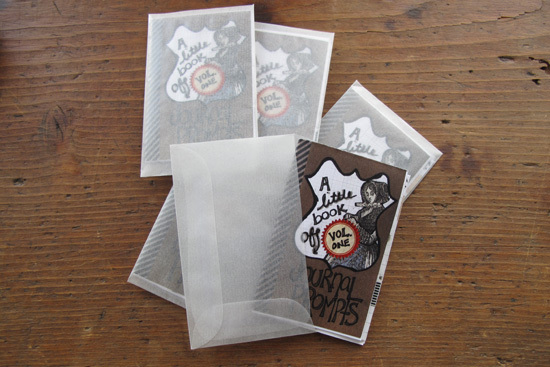 I make zines and the like too. Reciprocity, it's a good thing! *sigh* That last comment with the Leonard Cohen quote was me. I guess I signed in wrong, somehow. These little books are so cute, I love them! What a great little book. I love the theme! I would like to try and attempt to make them one of these days. My favorite quote is "Art washes away from the soul the dust of everyday life"- Picasso. I love that movie and can watch it over and over. True love always wins (or at least I like to think that). "Cluster together like stars." Henry Miller. What a great mini journal & love the packaging. Thanks! One of my favorite quotes is "Women who behave never make history." Your mini books are so cute!!! Your endless stream of ideas is truly amazing! Be still my heart! I would love to win one of your creations. Thank you so much for the chance!! Eee! this is soo cute! "Reader, I married him." I just love "Jane Eyre". Ok, it doesn't look like my comment took. Darn computer. These are sooo cute, Hope! Hope, I absolutely love your journals...would love to be as talented as you! :) I thought of another favorite quote of mine, which seems so appropriate for you and for another talented artist who I know so well! Oh Hope! 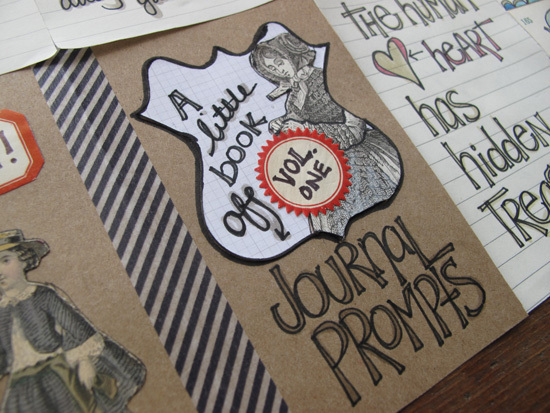 I would *LOVE* to win one of your journals! My favorite quote is: "Only she who attempts the absurd can achieve the impossible". "in our life there is a single colour, as on an artist's palette, which provides the meaning of life and art. it is the colour of love." a favorite quote of mine is I can only please one person at a time, Today is not your day! I love your mini book. I would be pleased to win especially since my BD is on the 24-hint, hint. My favorite quote is:from Ecc. " to everything there is a season... After winter comes the spring." Thank you for the chance to win such a precious little prize! Very cute! Those are awesome. "Life isn't about how to survive the storm. but how to dance in the rain" Seems I say that frequently lately! Thanks for the give away. The books are really nice! Another cute book! This is a quote I have on my desk: "Live, think, and act for today. Tomorrow may be too late." "Why have to be human? Was reading this and thinking that I would LOVE to have one of these neat little books!!! 2 fave (simple) quotes..."this too shall pass" and "less is more". Your little books are adorable! Thanks for the chance to win one! "A smile costs me nothing to give, but it becomes a treasure to those who receive it"
So many times I wish I had heeded THAT advice. What a fabulous little set! Thanks for the chance to win a mini journal! So sweet - I love your style. 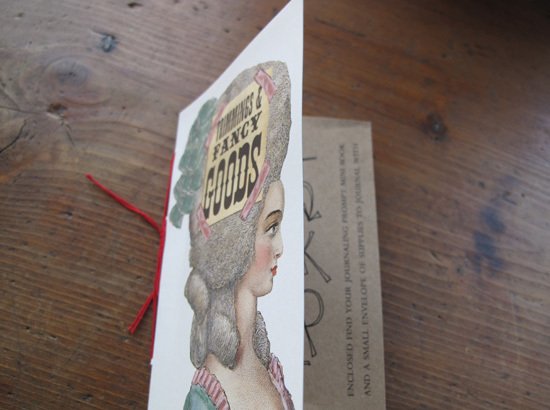 Hope, your little books are so beautiful and I just love the packaging you have put together! Not surprised as all your artwork is nothing short of wonderful!! "Life is not measured by the number of breaths we take...But by the number of moments that take our breath away. your mini journals are very creative. thank you for the opportunity. "some people wear their heart up on their sleave i wear mine underneath my right pant leg strapped to my boot" by Ani DiFranco. I never listen to her music but wow, her lyrics are really amazing. Seriously, I love it. Thanks for sharing how you put it together! it's so hard to choose just one quote. My favorite is "She refused to be bored, chiefly because she wasn't bored." Zelda Fitzgerald said it, but I wish I had. :) I'm obsessed with these little lovely books! I stopped breathing for a moment, Hope. What an absolute relief that I'm in the swap. Hold on. Got to get up to do a happy dance. I love quotes, so many favorites. Today, I love Louisa May Alcott's quote from Work: A Story of Experience. Love the mini books. I have my fav quote on my fridge so it greets me every day. "Opportunity is missed by most people because it is dressed in overalls and looks like work...Thomas Edison. My son also has a magnet quote he put on the fridge "Isnt there anything good to eat in here? "....he is 16 with a hollow leg and there is nothing in the fridge because he inhales it all! Love, love, love your mini books. I made one for a swap a few years ago and it was such fun to make and really impressed people. I am late to enter, but just wanted to say kudos to you! 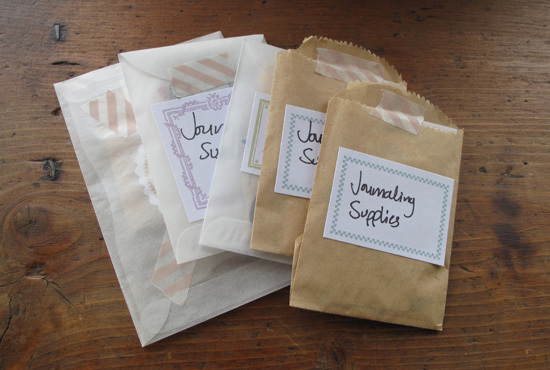 just getting around to blog hopping and i'm so glad to have stopped by tonight - i can hardly wait to get your little journal in the mail from michelle. they are fabulous hope ! we'll see what is does to prompt me to journal - since you know i'm not into that (yet) Hee Hee. Thanks for your contribution to this swap!